Save $5 off a performance featuring Nova Singers by purchasing tickets online before the show. 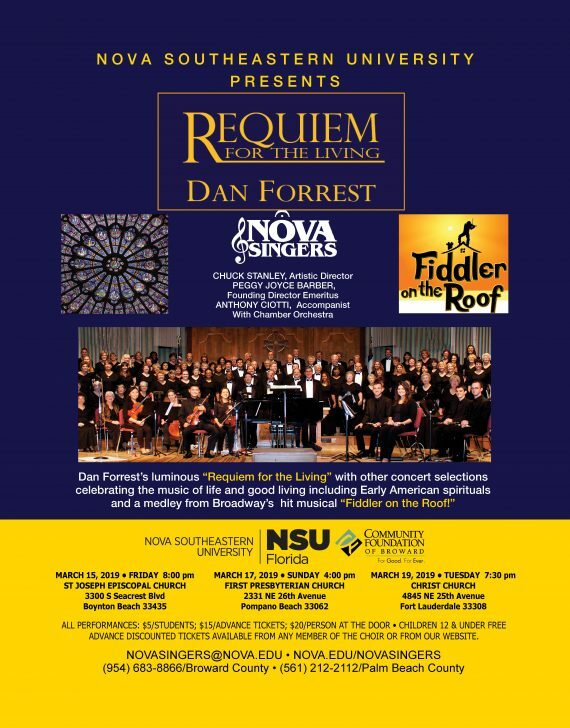 Nova Singers community chorus presents its spring concert series, which will include Dan Forrest’s “Requiem for the Living,” a medley from “Fiddler on the Roof,” early American spirituals and even a song from Monty Python. A Requiem, at its core, is a prayer for rest – traditionally, for the deceased. However, the five movements of Requiem for the Living form a narrative just as much for the living, and our own struggles with pain and sorrow. The second half of the program celebrates the music of life and good living. Friday, March 15, 2019 | 8 p.m.
Tuesday, March 19, 2019 | 7:30 p.m.
At the door, tickets are $20. Or purchase tickets online before the event and pay $15. Student tickets are $5, and children 12 and younger are free. The Nova Singers is Nova Southeastern University’s community chorus, whose approximately 140 members range from Nova undergraduate students to senior members of the local community. Auditions are held each year in September, January and March.